Russia’s President Dmitry Medvedev chose to celebrate Chekhov’s 150th birthday on 29 January in Taganrog. This was entirely fitting, for it was in this southern Russian city that the writer was born. Medvedev turns out to know and appreciate Chekhov’s work. 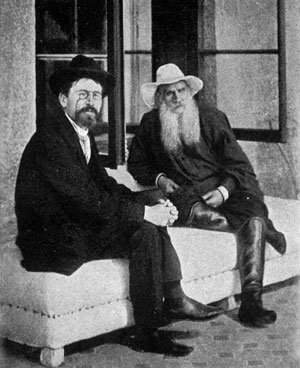 As a child, he distinguished him from Tolstoy by the length of his beard, it appears, while perceiving him to be just as old (Tolstoy was in fact Chekhov’s senior by thirty two years, and outlived him). Medvedev now knows that Chekhov never got to be old. He admitted that this year’s anniversary made him realize just how much Chekhov achieved in his short life: at forty four, he is the same age Anton Pavlovich was when he died. President Medvedev’s visit to Taganrog sends encouraging signals about the high regard the Russian state has for its great writers and the supreme contribution they have made to Russian and world civilization. That regard has not always been so obvious: in 2003 President Putin visited Chekhov’s house-museum in Yalta, but chose to ignore the plea for help addressed to him by its staff, who had been forced to witness its steady degradation since the collapse of the Soviet Union brought to an end its central funding. "People were saying that someone new had appeared on the sea front: a lady with a little dog." But it is situated in the Crimea, which Krushchev gave to Ukraine in 1954, and when Ukraine became independent in 1991, the traditionally Russocentric Crimea went with it. The museum’s staff were not exaggerating the seriousness of the situation when they appealed to President Putin: in 2007 the museum had to be partially closed due to the mould in the house’s walls. There was simply no money in the museum’s now tiny budget to pay for a functional heating system and so prevent damp appearing. The Ukrainian government seems to have neither the resources nor the will to restore and preserve the building and its precious contents, and the Russian government does not appear to feel responsibility any longer for its maintenance. For now, the museum depends on the Crimean Autonomous Republic, which can only afford to contribute towards the meagre salaries of its devoted staff. One of the most popular events held in England to celebrate Chekhov’s 150th anniversary was a sell-out week of readings, informal performances and discussions at London’s Hampstead Theatre. With the help of leading British actors, directors and writers, and the generosity of the Lebedev family, the week raised around £60 000 for a campaign I started in the UK to draw attention to the Yalta museum’s plight, and raise money to pay for the house’s restoration. "Then he started bumping into her several times a day in the municipal garden..."
I was not wrong in believing Chekhov’s fans in Britain would want to help. The great affection for Chekhov in this country is based mostly on the popularity of his last plays, which continue to be staged frequently and enthusiastically. The British love Chekhov’s understatement and lack of pretension; they relish his ironic humour, and his sympathy for the underdog. They love the supreme artistry of his dramas which are beautiful and poetic when performed well, and somehow magically full of meaning for our times. Maybe one day Chekhov will age, but he still seems modern in his existentialist take on life. His characters are profoundly Russian, but their dilemmas are universal. Undoubtedly we British have a habit of wanting to recognise ourselves in characters who have difficulties in communicating emotions and odd idiosyncracies. But we are also drawn to Chekhov’s self-effacing but deep humanity, even if it is something we only sense instinctively through hearing his lines being spoken. "In the evening, when the wind had dropped a little, they went down to the jetty to watch the steamer come in." All these things came to the fore for me when I was researching Chekhov’s life in preparation for writing his biography. But, like so many others, I was also increasingly moved by how Chekhov had chosen to live his life. How inspiring that he had quietly gone and built schools, and did his best to promote community health care, for example, when he could have simply sat back and enjoyed his literary success. How inspiring that he had helped sufferers of tuberculosis in Yalta while dying of the disease himself. Inspiring, too that he had been sensitive to Crimea’s displaced Tatar minority, and that he had gone on writing until the very last, without the faintest whiff of self-pity. Chekhov was always very clear about the cultural values he thought worth standing up for. For me they are encapsulated in the house that he pointedly built for himself in a Tatar village, away from Yalta’s bright lights. That is why, along with its many other merits, Chekhov’s house in Yalta deserves to be properly restored and maintained. Until Ukraine has the equivalent of the National Trust, or a mechanism for legally protecting buildings of historical value, we all have a duty to support the museum’s beleagured staff in their quest to safeguard its future. Meanwhile, we can also continue to hope that the governments of Russia and Ukraine will transcend whatever political differences have so far stopped them from embarking on a joint cultural project which would arouse the world’s admiration, and prove that their high regard for their shared cultural legacy is not circumscribed by narrow nationalist concerns. Chekhov moved into the “White Dacha” (as the locals immediately christened it) in the autumn of 1899, and “The Lady with the Little Dog” was one of the first works he wrote there. That summer he had stayed on the famous seafront in one of Yalta’s best hotels while vacationing with Olga Knipper, the Moscow Art Theatre actress whom he would marry two years later. He probably took particular notice of the young ladies who passed in front of his balcony with little dogs on leads. At his country house in Moscow he was greatly attached to his two beloved dachshunds, Bromide and Quinine, and two Siberian huskies, one named after the explorer Fridtjof Nansen whom he admired. At the White Dacha he would be joined not only by his mother, whom he cared for throughout his adult life, his sister and his wife (who both came for holidays), but also by a motley assortment of mongrel dogs. It was in keeping with Chekhov’s character that despite his professed lack of concern for Kashtanka, the laziest of them, who spent all day sleeping under the olive tree, when he was run over by a passing carriage one day, he performed emergency surgery to his broken back leg. Kashtanka was soon running around again. Chekhov once made a note about the Moslem custom of digging wells to save one’s soul, adding: “It would be good if each of us left a school or a well or something similar, so that our lives did not go by and disappear into eternity without trace”.